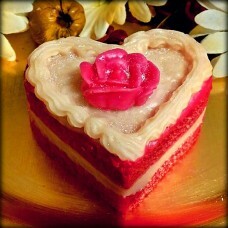 This adorable highly scented Heart Cake Melt is just amazing, from the rose on the top to the layers of icing inbetween the wax cake, you will be amazed at the detail. Color will vary depending on the fragrance you choose and it is available in all our wonderful fragrances. This melt is made with the same softer wax that we use in all our melts so it is easy to cut up and add just the right amount to your tart warmers. *There is a lot of labor involved with this melt and you will see that reflected in the price.